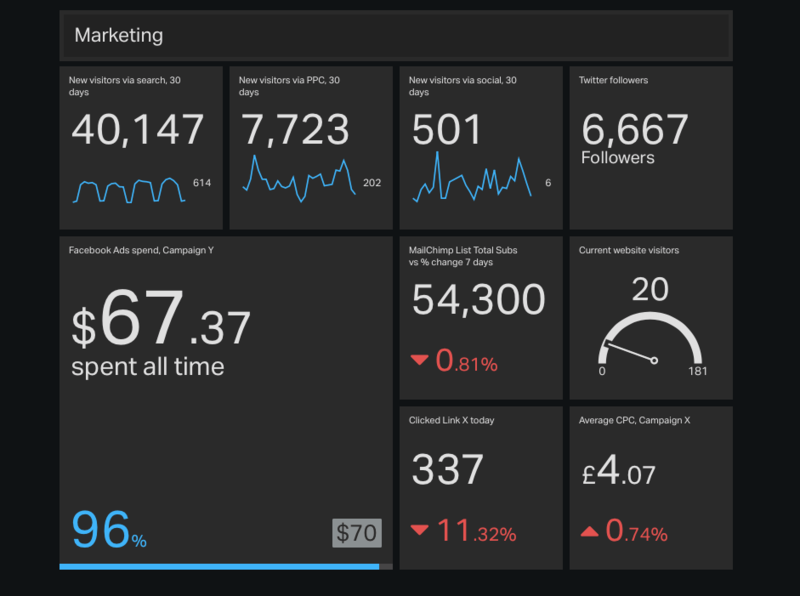 We'll be building a simple ‘overview’ style Marketing Dashboard for our digital marketing team that’s interested in monitoring how several different marketing channels are performing. Our marketing team is interested in bringing new visitors to their website, and their dashboard shows that they’re currently focused on driving visits via organic search, social media, email and pay-per-click advertising. But for now, this general KPI dashboard shows a good breadth and depth of information for a the team to start acting upon. 1) If you haven't already, you can sign up for a free 30-day Geckoboard trial here. 2) After you're logged in to your account, click on the 'Dashboards' menu to the top left and add a new dashboard by clicking on '+ Add dashboard'. Give your dashboard a name. 3) On your newly created dashboard, click on 'Settings' in the header and then 'Dashboard settings'. 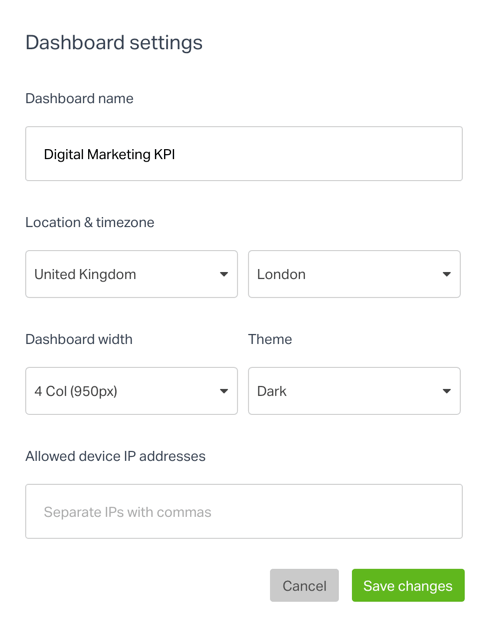 Set the dashboard's Location and Timezone to match the timezone set within the services you'll be connecting, that is, to timezone set within your Google Analytics, Google AdWords, MailChimp, etc. This is required to ensure there's no lag in the data being fetched from these accounts. 4) Set the dashboard width to 4 columns (950px). If you need, you can adjust the dashboard width to match that of your display screen later on. 5) The default settings should be good for the remaining options on this page. Click 'Save Changes'. You'll need to create connections to your services so that Geckoboard is able to pull in your data. Here are the steps to creating a connection with Google Analytics. The process will more or less remain similar for other integrations as well. 1. On your dashboard, click on the '+Add widget' button. 2. Now, search for 'Google Analytics' using the search bar on top. Alternatively, you can also scroll down the list of integrations ordered alphabetically till you reach the Google Analytics integration. 3. Click on the integration to proceed further. Select any one of the widgets available under the integration. 4. You'll now be prompted to create a connection. If you aren't already, log into your Google Analytics account by entering your credentials in the window that pops up. 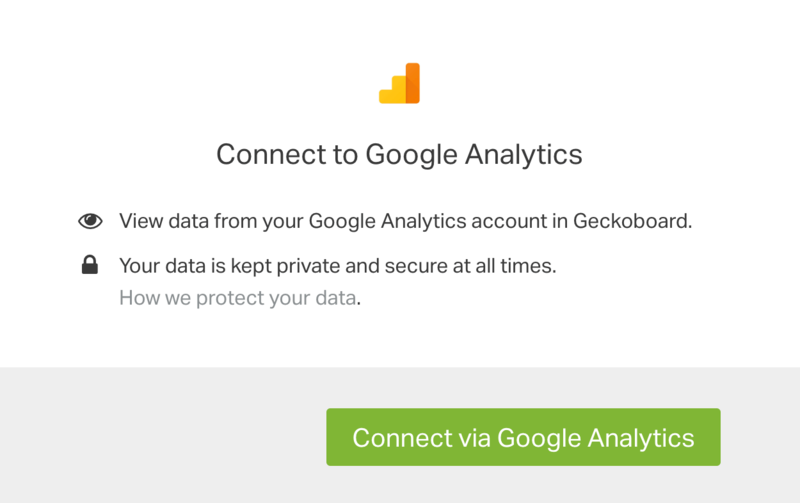 Then, 'Allow' Geckoboard access to your Google Analytics. Your Google Analytics connection should be set up! You only need to do this once. Going forward all the widgets you add will be able to access this connection and pull in data from your Google Analytics account. If needed, you can also create connections with multiple Google Analytics accounts - more details here. It's important to note that the particular filters and options we'll be using to create these widgets are only examples to help you get started with your Marketing Dashboard. You can later tweak and modify your widgets' configurations to better suit your data tracking requirements. Let's get started with the widgets! This widget displays the new visitors coming to the website via search. We're only displaying results coming from Google. You can include more search engines as well. 1) Head over to your dashboard, click on '+Add widget' and search for the Google Analytics integration. Click on the integration to proceed further. 2) Search for and select the 'Visitor Number Stats' widget. 3) If this is the first time you're using the integration, you'll need to create a connection to your Google Analytics account. 5) When you're happy with all the widget settings, click 'Add widget'. You now have the first widget for your Marketing Dashboard! This widget displays the new visitors coming to the website via PPC. 1) Head over to your dashboard again, click on '+Add widget' and search for the Google Analytics integration. Click on the integration to proceed further. 4) When you're happy with all the widget settings, click 'Add widget'. You're now tracking new visitors via PPC on your dashboard! The fitler 'ga:medium==ppc' will only track traffic coming via PPC. You can confirm that these are indeed the filters GA uses for it's built-in 'Paid Traffic' segment from their guide documentation here and here. Further, it may be the case that you're using non-conventional UTM codes (eg: &utm_medium=ads2016), that is besides the ones GA uses by default, to track your paid advertising and campaigns. If so, you can include those as well in your filters. Another way to go about this would be using custom segments. You can create a custom segment in your GA for all your paid traffic sources. Any time you create a custom segment in your GA, they'll automatically be available under Geckoboard as well. You can simply select them from the 'Segment' option while configuring the widget. Build the 'New Users' filter into the custom segment you create in your GA. You can then simply select that segment while setting up the widget, without requiring to use any other manual filters. This widget displays the new visitors coming to the website via social media sources. Note: We've picked up the 'ga:hasSocialSourceReferral==Yes' filter based on how GA defines it's default 'Social' channel as explained in their documentation here. You can also include any other custom social sources that you want to track. You can find out more about using GA filters here. If required, you can also create a custom segment, as explained in the previous widget, to track traffic coming from social sources. With that, you'll be tracking your traffic coming in from social media! This widget tracks your current number of Twitter followers. 1) Head over to your dashboard, click on '+Add widget' and search for the Twitter integration. Click on the integration to proceed further. 2) Search for and select the 'Follower Count' widget. 3) If this is the first time you're using the integration, you'll need to create a connection to your Twitter account. You should now be tracking your Twitter followers on your dashboard! This widget tracks the all time, total amount you've spent so far on Facebook advertising for a particular campaign. You can also track the spend across the entire account, for ad sets or for a particular ad. A good range of time period options are also available to choose from. 1) Head over to your dashboard, click on '+Add widget' and search for the Facebook Ads integration. Click on the integration to proceed further. 2) Select the 'Ad Stats' widget. 3) If this is the first time you're using the integration, you'll need to create a connection to your Facebook Ads account. You're now tracking your Facebook Ads spend on your dashboard! This widget tracks the weekly growth of the company's mailing list. 1) Head over to your dashboard, click on '+Add widget' and search for the MailChimp integration. Click on the integration to proceed further. 2) Select the 'List Metrics Number Stat' widget. 3) If this is the first time you're using the integration, you'll need to create a connection to your MailChimp account. You're now tracking your mailing list growth on your dashboard! This widget tracks the current number of visitors on the marketing site. This is a nice addition that gets team members glancing at the dashboard several times a day. The team can also react quickly to any sudden changes in traffic, for example, if there's a spike in number of visitors when not many customer support reps are available for chat / call support. 2) Search for and select the 'Current Visitor Gauge' widget. You'll now be tracking the current visitors on your website on your dashboard! Our marketing team has just launched ‘Campaign X’. Both this and the next widget track metrics related to Campaign X. This widget helps monitor the campaign's early progress by showing how many clicks have occurred today on the main Call-to-Action link X on it's landing page. 1) Head over to your dashboard, click on '+Add widget' and search for the Mixpanel integration. Click on the integration to proceed further. 2) Select the 'Trends Number' widget. 3) If this is the first time you're using the integration, you'll need to create a connection to your Mixpanel account. You'll now be tracking the total clicks today for the Call-to-Action Link X and monitoring the progress of your latest marketing campaign on your dashboard! This is a temporary widget that has been added while someone in our marketing team experiments with Google AdWords paid search. It displays the average CPC for our marketing Campaign X. 1) Head over to your dashboard, click on '+Add widget' and search for the Google AdWords integration. Click on the integration to proceed further. 2) Select the 'Performance Metrics' widget. 3) If this is the first time you're using the integration, you'll need to create a connection to your Google AdWords account. You're now tracking the average CPC for Campaign X on your dashboard! This widget acts as a header and gives context when viewing the dashboards on TV screens. 1) Click on '+Add widget' and search for the Text widget. Select it to proceed ahead. 3) Set the size as 'full-width' and click on 'Add widget'. 2) You can also move multiple widgets at a time! Click and drag your mouse over the widgets you want to move as shown in the GIF below. You can then move those around. Once you're done, click and drag your mouse in an empty space in the dashboard or over a single widget to de-select the widgets. This feature is especially handy when you want to, say, move the full-width 'Marketing' header widget to the top of the dashboard and adjust the remaining widgets correspondingly. You can find our recommended approach, devices and screens for displaying your dashboard(s) to your team in our guide here.